Set up in 1998 and awarded the “Restauranteurs de France” L’Angelus is one of the most authentic and highly appreciated French restaurants in the region, thanks to its reputation of genuine consistency. 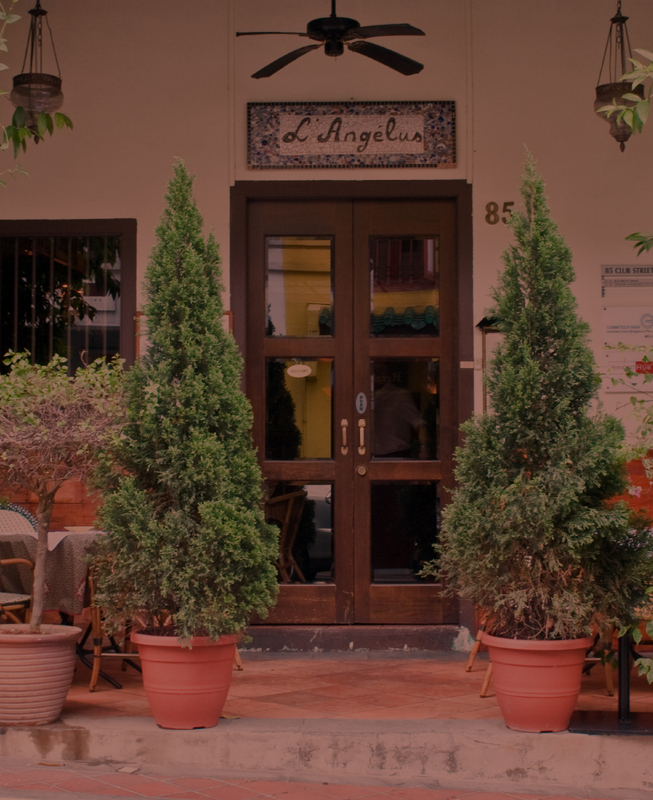 As Singapore’s oldest single-location traditional French restaurant, L’Angelus values the French gastronomy by offering traditional French cooking prepared with high-quality ingredients air-flown and complemented by a unique wine list, full of gems for lovers of older vintages. Reminiscent of the charming restaurants tucked away in the corners of Paris, the setting and décor of L’Angelus evoke a Parisian atmosphere as thick as the chef’s French Onion Soup. The décor has a traditional feel which hasn’t changed in the restaurant’s long history. Enter L’Angelus and walk past the pigeonholes with our oldest patrons’ napkins to get immersed in a cozy dining environment with wonderfully crafted French artefacts and vintage posters from bygone eras. Armed with your favorite glass of wine or vintage Armagnac, take a stroll through the passage beyond the kitchen to search for a familiar face in the rows of sepia-toned photographs lining the walls. L’Angelus has steadfastly continued the fine tradition of serving top quality authentic French cuisine with friendly service to this day. Our menu boasts of the best of French food, from traditional to classical. L’Angelus’ kitchen is headed by Chef Ken and is known for his adherence to consistency towards traditional cuisine classique and stresses the importance of fresh ingredients of the highest quality. Trained in the intricate art of French culinary, Chef Ken has learned with the best talents in the industry over 17 years, having worked with renowned chefs and in prestigious maisons. Chef Ken’s inspired traditional cooking is full of pleasant surprises and a perfect example of how fresh ingredients can enhance classical French cuisine that L’Angelus has been famous for since 1998. Chef Jimmy is our Sous Chef and he brings innovation to the kitchen and is focused to ensure that each diner’s palate is sufficiently tickled through his R&D efforts. With a passion for developing inherent flavors in classical French-inspired dishes, our chefs are committed to using the freshest ingredients to create perfectly balanced menus. Our main ingredients are meticulously sourced to ensure a high degree of freshness. Be it fresh seafood, wild catch fish, fresh gourmet meat, farmed poultry or fruits and vegetables, every element is of the highest quality possible. The bar is perhaps the best-kept secret of L’Angelus. Apart from an exhaustive wine selection from France, we also serve a large selection of whiskies, vodkas, gins, liqueurs, cocktails, rums and Armagnacs. With personalized attention from our General Manager David with soft jazz in the background, it is the perfect place for a relaxed drink before or after your dinner. Our wine selection is entirely French, from the different wine-growing regions of France.